A group of residents who are fighting plans to overturn night flights in and out of Dublin Airport are determined not to let it happen. The move comes after more than 20 farmers and property owners living along Kilreesk lane in St Margaret’s north Dublin lost their right to appeal a High Court decision to the Supreme Court last year in a bid to stop the €320m runway being progressed. The property owners and farmers now fear that the exclusion of night flights will be lifted following a debate on the issue in the Dáil on Wednesday night. Information from Fingal County Council, who are understood to be the lead organisation on noise levels of night flights in and out of Dublin was discussed. 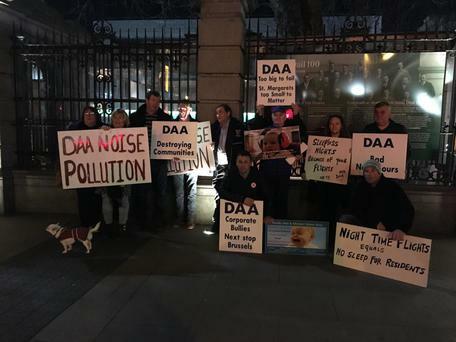 The property owners protested outside the Dáil on Wednesday night and at a ceremony held at the turning of the sod on the new north runway by Taoiseach Leo Varadkar and Transport Minister Shane Ross. The residents have already staged a four long protest outside St Margaret’s GAA club. The new runway, which is due to be fully inished by 2021, has been planned for since the late 1960s and has featured in subsequent county development plans. Approval for the 3,110 metre runway was granted by An Bord Pleanála in 2007. However, due to the economic downturn, the project was put on hold for several years. The daa has said that the recovery in the economy has seen passenger numbers reach record levels with more than 30 million passengers travelling through Dublin Airport last year. Over that time he has built up a substantial dairy farm. Where Mr Scully and his family live, is located 1.5km from the current runway. This will fall to 0.5Km when the new runway is completed. He farms 75 acres he owns along with another 60 acres he leases from the daa with his brother John and 28-year-old daughter Aine. Mr Scully, who will loose his home, farm and livelihood said:“ We will continue our protests against the new runway as all we want is to be treated fairly. We have lost our right to appeal our case to the Supreme Court. We now are left with no other option but to protest. “If the ban on night flights are lifted then that will just be intolerable. We feel as if we are being pushed to the very limit. “First the daa offered 20pc above the market value of our house and all the properties along this lane and now that’s gone to 30pc but nothing for our lands and livelihoods. “Their offer means nothing to me nor my family. Where are we supposed to go in this day and age. Trying to go and set-up again on a new land would be financially impossible. “Essentially people are damned if they do stay, as they will be subjected to 100 dB noise every two minutes over their homes, or lose their dreams homes which most are on family lands – some fourth and fifth generations that existed prior to Dublin airport ever being there.